As the Press reported recently, this building at the end of Clarence Street, Groves Chapel, may soon include a new Sainsbury’s store on its ground floor. It’s a listed (Grade II) building so the store will have to fit into it ‘sympathetically’. Not sure how that’s going to be achieved, and we won’t know until the planning application has been submitted, giving further details. Personally I’m reserving judgement until then. If the conversion involves removing many of the building’s more impressive architectural details then clearly that should be opposed. But I wonder how many are left anyway, on the ground floor, where the shop would be. The building has been used by the local health authority in recent decades. Perhaps a lot of the interior features have already been removed, decades ago. Just opposite, across the junction, is the Punch Bowl pub, which, as previously discussed, Tesco is apparently keen to acquire. The plans are being strongly opposed by regulars at the pub, with a petition, and York CAMRA are also involved, but beyond that the wider community of the city doesn’t seem too concerned. Not far away, over on Burton Stone Lane, the Corner House is to close very soon, 16th November. It will be a Tesco store, apparently. There’s been no massive public outcry, no campaign to save it. The locals perhaps care but the rest of the city doesn’t seem to. Here’s a map of the existing Sainsbury’s stores in the area, and Groves Chapel in relation to those, and also the locations where Tesco is about to move in or wants to. So the wider York community doesn’t seem to have been angered by Tesco wanting to set up shop on the sites of two pubs. Whereas the plans for Sainsbury’s to move into Groves Chapel have already provoked a number of angry comments on Twitter and elsewhere. There’s already a petition against this, and it’s collecting signatures rapidly. When I discovered it first thing this morning it had 100 signatures. Now, early afternoon, it has almost 200. I’ve been thinking a lot about why some buildings/plans/places capture the public imagination or provoke outrage and others don’t. Previously I was comparing the two pubs in this area under threat from Tesco and wondering why the regulars at one had campaigned against closure whereas the regulars at the other apparently hadn’t. Now we have, opposite one of them, Sainsbury’s wanting to set up shop in the Groves Chapel. And clearly in this case there’s far more opposition and anger from all over the place, not just the community nearby. I just want to ask a few questions. I’m finding it all very interesting. Why are people so outraged? Because it’s a former chapel? Is that somehow worse, more offensive? Why? It hasn’t been used as a place of worship for decades. This building has outlived its usefulness as a chapel and more recently as a building used by the health authority. The local community haven’t been using it, most of us have never seen inside it. Should we keep it there empty and unused just so it looks nice from the outside? Except it doesn’t, it looks a bit scruffy and in need of investment and maintenance. Who’s going to pay for that if it isn’t refurbished and put to a new use? Is it because it’s on a main thoroughfare rather than stuck out in a quieter residential area that it has become the focus of protest? Presumably so. Because it’s a landmark building, and more of us are familiar with it? Is it because it’s another Sainsbury’s? Would it be better if it was, say, a Co-op store? I’d prefer that, personally, as there isn’t one in the area. How many people objecting to the planned store live in the local area? Perhaps the views of the people who live within walking distance should have more weight than the views of those living on the other side of town? Many comments I’m seeing online are from people who live nowhere near the building in question. I do live near it. And part of me wants to question whether people living miles away should be able to tell ‘us’, nearby, what supermarkets we should or shouldn’t welcome. Where do the people who are objecting do their shopping? At one of the larger supermarkets perhaps, perhaps they drive there? Most of us do, after all, shop at the supermarkets, don’t we. But if you live near the city centre, and don’t own a car, these smaller supermarkets are very convenient. Like it or not, they’re very good at what they do, aren’t they, Sainsbury’s, Tesco. Maybe some of us like to spend a lot of time shopping at different small food shops, searching out all locally-produced food from local businesses, but many of us don’t. Many of us want to grab the stuff we need as quickly as possible from a convenient local outlet where we know exactly what they’re going to have, where in the store it is, and where we know it will be of a standard quality. Not perhaps as nice as the veg on the market or the meat from the local butcher, but good enough. I guess many of us try to do both, but rely on the local mini-supermarkets particularly in the evening if we need a pint of milk. Personally I’m rather glad there are a couple within easy walking distance of my house. I strongly oppose the idea of Tesco setting up shop on the site of the Punch Bowl pub opposite, for reasons previously mentioned. But most of the things that make that objectionable don’t apply here, in this large and apparently unused building across the road. I’ve been compiling the pages on this website for a long time, and paying attention to what is happening (or not happening) to various historic buildings, listed or not, all over town and particularly in this area. Buildings like this can sit empty for years on end, many did. The most famous example of a long-empty building is the White Swan on Piccadilly. That development into residential accommodation also seems to have been possible only by the associated inclusion of a Sainsbury’s on the ground floor. Would we rather it was still sitting there rotting away? 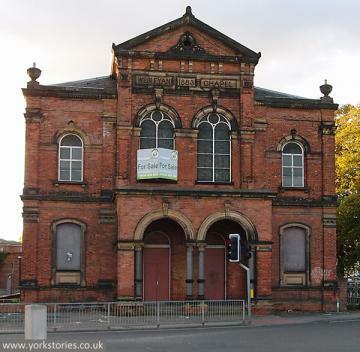 Yes, it would be great if the old Groves Chapel could become some kind of community-focused cultural hub, maybe open as a venue, a dance hall, an indoor market. But it looks like that isn’t going to happen. The hospital is right next to it, just across the lane/snicket of Bridge Lane. Many people on their way to the hospital, perhaps to visit relatives, will no doubt be glad of a shop they can pop into close by, a familiar store with all its usual stock. I imagine, because it would be so close to the hospital, that near the entrance will be a prominent display of bouquets of flowers, and magazines. And boxes of grapes. Because, as we know, they’re good at what they do, and they know what we need/want. That’s why they’re so successful, and that’s presumably why they’re appearing all over the city where our pubs and chapels used to be. If you want to add your signature to the petition, it’s on this link. Having this fine building in use again will make a huge contribution to improving this rather down-at-heel junction. Perhaps we can get the ugly and obtrusive street furniture and clutter sorted out as part of the same development. I don’t live in that part of York but, having had been an all-too-frequent visitor to the hospital over the last few years, frequently pass that way. It always saddens me to see the decaying state of the building and the blighting effect it has on its immediate surroundings This proposal seems to offer the best opportunity in years to solve that problem. If well executed it looks like an excellent idea to me. Far better than the thoroughly misbegotten Tesco Punch Bowl proposal. Quick update: I’ve been watching with interest the petition on change.org, which has an update about what other action is being taken. See http://chn.ge/1163QMA for more. Particularly interesting is that one of the signatures is Ian Loftus, who I assume must be this Ian Loftus: http://www.yorkpress.co.uk/business/yorkmeans/4867882.Ian_Loftus_to_turn_former_Beams_Tearooms_in_Stonegate__York___into_a_beer_caf__/ He says in the comments that his reason for signing is that he put in an offer, to keep the building as it is now. If that’s the case I’d be interested to know why that didn’t get any further. A creative and interesting use would be preferable to a supermarket. If anyone has any more info on this do let me know. I’m sure many of us might be interested in backing some viable alternative idea. It reminds me of the situation with the old Reynard’s garage/Airspeed building, in that there’s a comment about the sale of this asset needing to make as much money as possible. In this case for the NHS Trust, in the Reynard’s case for City of York Council. Is it similar in that? Seems so to me. An obligation to sell to the highest bidder? If so, what about other notions of ‘value’. I’m all for us taking more notice of them. I think part of the reason for the opposition is that these mini-supermarkets are cropping up everywhere, and often have the effect of stifling independent shops which don’t enjoy the benefits of brand recognition, economies of scale, buying power etc as the big names do. I understand a lot of the small supermarket sites don’t actually make a particularly big profit but are often sited to prevent a competitor having a presence there. However, it’s hard to imagine what other business would be suitable for the site as I imagine the (I presume) lack of parking would make it unsuitable for use as flats/holiday lets, and the location might well make other uses unviable e.g. a music venue. The point someone else made about the NHS having to accept the highest bid may well be accurate too which could rule out some more noble uses for the place! Hi Chris, the point about the highest bid is just what I deduce from the comment in that article in the Press linked to above, which says: ‘The York Hospital Trust has said it is obliged to dispose of assets it does not use and to go for the offer which is most beneficial for the NHS.’ By most beneficial I guess they mean highest bid? These small supermarkets do of course have an impact on other shops around, some of them, and I imagine the Spar on Lowther Street and the late-opening store and off-licence on Clarence Street will lose customers to a Sainsbury’s if it opens. Whether that means a Sainsbury’s shouldn’t open there … as I think I’ve said already in the article above, I think many people in the Groves area might be glad to have a Sainsbury’s store close by. Spent many hours up and down Lowther St over years taking daughters to brownies and the park, many excellent curries, trips for emergency provisions from Spar and when i first moved into area a butchers! I think there is question here. The difference now between say the whole Bishy road thing and what we have in Groves is massive. Why are the routes from centre of town out this way so grim? Not sure if there is a fully formed plan for Piccadilly but even Fossgate and Walmgate now nice places to be. Why does the good old Groves always seem to be struggling? Was struck on two recent trips to London when spent quite a bit of time around the Angel (area East + SE of Kings cross) just how vibrant it was. Lots of people young and old walking around at all times of day and night. No dodging drunks and their left overs on street. “Drug related” crappola etc. I saw zero trouble all the time i was down there. Ok there was traffic but seemed somehow better than our congested streets. Try walking across town using so called pedestrianised areas first thing in morning! This may be controversial but i think we have got to “claim” these areas as being for “people” and not just run down semi derelict sites on busy car dominated corners. A Tesco opposite may not be end of world. But why not use chapel as a sort of Student Union? Perhaps the “quality” of the students is better at UCL than local lot but I think we should give them benefit of the doubt. Imagine the place lit up at night with people arranging to meet or just hang out. Maybe incorporate a cafe, space to rent out for clubs, some sporting equipment upstairs. Table tennis popular at Clarence and Con club!